Piggity Hog's Diggity Blog: Well let's start the insanity. Well let's start the insanity. For what was going to be my first blog post I'm following the not so gentle prompting from Brandi to just start. I have some past drafts I never finished, and I'll get to those eventually, but my first "assignment" is to "share five things you are obsessed with, and then pass the award on to five of the most fabulous blogs you read!". First of all, that second part won't happen. The word fabulous has never originated in my head and any blog I might read has already been sent this award. (I don't know how this is an award, but I didn't write the directions.) Second, what does it mean by obsessed? Brandi said it's stuff you're interested in or think about a lot, but apparently world views, why people often put so little thought into eternal matters, how people get the political views they have, etc. is too serious. She's right. Those all have too many complex layers to do justice in this post. So, after spending a day or two writing down the interests my brain wanders to when I'm not paying attention, I have a list. 1) Football - That would be American football.A sport I find it to be an amazing combination of one-on-one physical battles, groups functioning with one mind and purpose, strategery, instinctive decision making, mental toughness and intestinal fortitude.I prefer college to professional because of both the competition level, diversity of playing styles and the electrifying atmospheres on campus where the players on the field are members of the student bodies and represent by choice their school and the thousands of students and alumni that love their schools, pack the stadiums and create those atmospheres. I love my job, but if my job was something else, it would involve football. 2) Arkansas Razorbacks - Speaking of loving your school, mine is the University of Arkansas. I went to my first games to watch my cousin kick and punt. I got hooked on the student section in high school after spending amazing basketball games with the most electrifying fans in college sports entertainment. For me, it was the best combination of academics, location, sports programs and payout. I highly recommend getting an undergraduate degree from a major school that will pay you to attend. 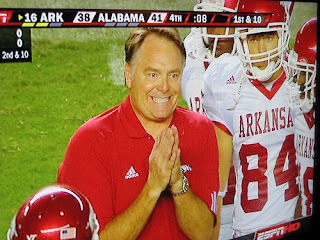 I follow Razorback sports closely, especially football, and have very strong opinions about certain . . .uh . . issues. Nope, definitely no issues here. Move long. There's nothing to see. 3) Seinfeld - Its weaving of story lines, grossly exaggerated characters, phrases and commentary that’s been integrated into my daily vocabulary put Seinfeld on the list. The first episode I ever saw was The Marine Biologist, and when George finished his story, that was it, I was hooked. Our favorite phrases are still used regularly around our house and were even integral in Brandi's naming of my blog. We got the Seinfeld Scene-It game for Christmas one year, but we rarely play it because neither of us miss questions. They never ask the tough questions like, "Who was George's "It girl"?". This quote remix video had about a 50% hit rate of things that can be heard in our home, and it even had this post's title at 0:18. 4) Wiki sites - If you haven't noticed already, I like wiki sites as references. Most everyone i know is a nerd about something, and nerds are fanatical about correct information on their specialty. This includes user created data bases. Although they can be vandalized, such as Less Miles being labeled functionally retarded after certain LSU losses, the nerds who play meticulous watch guards of their realm keep most misinformation at bay. 5) Top down vs. bottom up approaches - While solutions to social problems are important, I'm talking about how how subjects can be taught in the most effecient and effective way. Since I'm a math and science guy married to a math and science gal, we talk about this fairly often. Most math, science and engineering is taught bottom up for several reasons. (1) When starting a new subject, not a whole lot can be said about the histoy without having to explain some of the details. Most textbooks give a token chater or section to the history of the subject and then never return, so thats how the teachers present it. (2) To teach these subjets top-down, it take a tremendous amount of planning and time to guide students though the discovery process. it alo taks a group of students highly dedicated to excellence. However, when this is done, it creates strong students that can then see these subjects "from the top" in later classes that teach bottom-up. My 9th gade honors Physical Science class was that way, and it was the absolute best class I have ever taken. I use principles I learned in there every single day at my job.